German technology prefabricated joint less operation theatre having 0.3 micron Laminar Air flow. Walls painted by British antibacterial & antifungal paint. 6 operation theatres. 5 major O.T. & 1 minor O.T. All 5 O.T. class 100 (Highest level) with 0.3 micron HEPA filters & Laminar air flow. 3 joint less modular O.T. class 10000 having 5 micron bacteria free air supply. Most advanced sterilization department equipped with ETO, Washer with Lubricant, Ultrasonic cleaner, Flash sterilizer & 2 high pressure horizontal steam sterilizers. Special room to store sterilized instruments with 5 micron air supply. Scopy theatre has 3-chip camera, xenon light source, medical grade monitor mounted on extra rotating arm of O.T. light. Karl Storz set for Pediatric & Adult laparoscopic surgery, Arthroscopy, Cystoscopy & resectoscopy. Operating microscope for Neurosurgery. Imported remote control operation tables, 130000 lux imported O.T. lights minimum 2 domes. 3 C-arm machines, 7 Anesthesia trolley including 2 imported Dragger trolley with gas analyzer. 7 cautery machines, 9 two arm rotating pendants. Central O2, No2, Co2, Suction & Medical grade compressed air, outlets on pendants. Central monitoring by 8 parameter Phillips interactive monitors. Orthopedic dept. . Joint replacement surgery, Arthroscopy, Spine surgery, Pediatric Orthopedic surgery & Simple & complicated non union fracture treatment. Osteoporosis clinic, cerebral palsy clinic. Pediatric Surgery Dept. 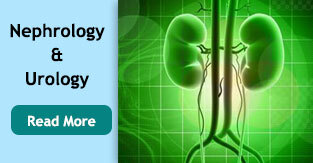 Pediatric trauma including burns, Neonatal & Pediatric laparoscopic & open surgery. 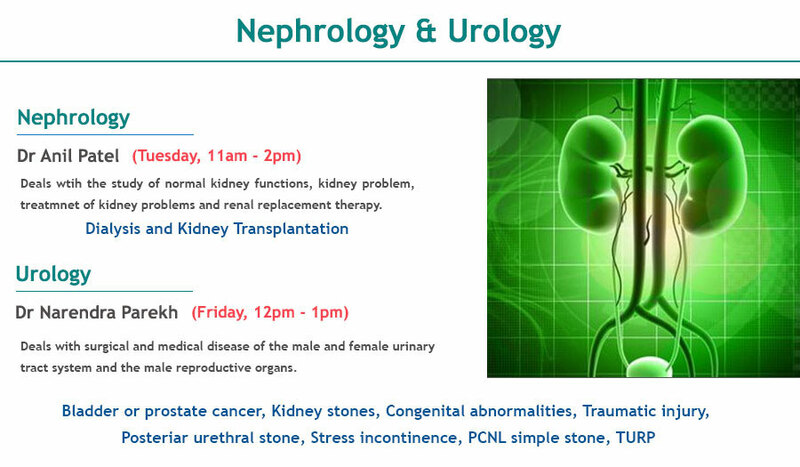 Pediatric Urology, Cryo surgery, Cystoscopy, Sigmoidoscopy. General & Laparoscopic surgery. Advanced laparoscopic surgery. 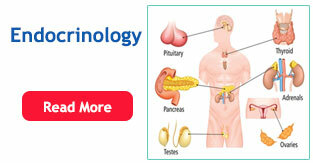 All types of general surgery for Hernia, Hydrocele, Gall bladder, Appendix, Intestines, Breast, Thyroid, & Cancer. Special stapler surgery for piles MIPS. 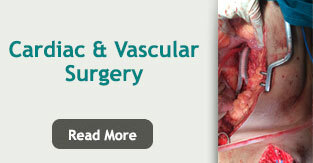 Plasic surgery, Cardio Vascular surgery. First time in Gujarat 3 compartment I.C.U. having separate 5 micron clean fresh air supply. 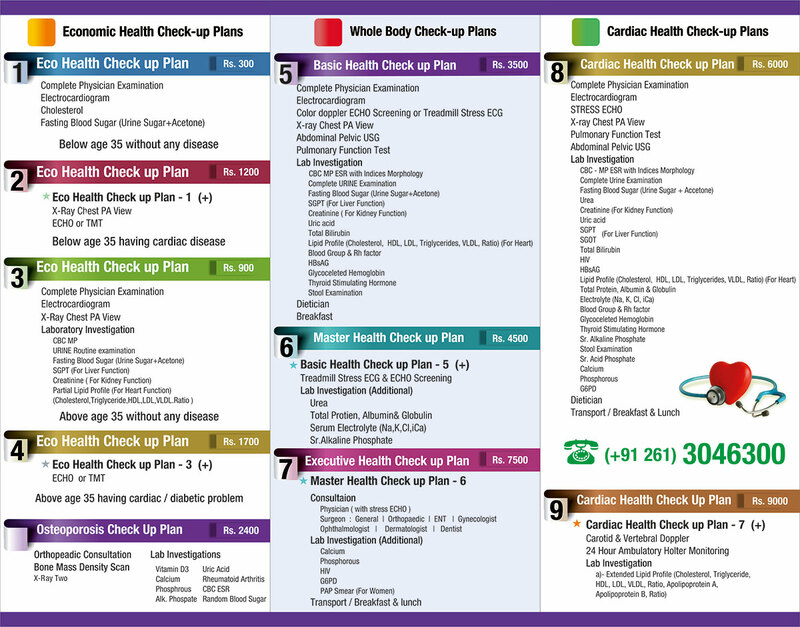 24 X 7 round the clock, simultaneous & continuous monitoring of all hospital patients by M.D. physician from central station. High end modular, 8 parameter Philips interactive monitor system. With use of internet patient can be monitored from remote area & B.P. can be checked. Facility for 2-D Echocardiography, Tread mill test (Stress ECG), 24/48 hours Holter monitoring, 24 hours ambulatory B.P. monitoring, Pulmonary function test. Facility of Temporary Pace Maker placement. Whole body check up, Basic health check up, Executive health check up, Pre insurance or Pre employment health check up packages available. Visiting Nephrologist, Neuro physician, Hematologist, Oncologist (Cancer physician), Endocrinologist. Fully equipped A.C. Physiotherapy dept. having Imported whole body massage chair, Ultrasound, Diathermy, Interferential, Wax bath, Traction. Services of qualified Dietician in O.P.D. & for admitted patient. Special food as per advice of dietician. Emergency:- All type of Trauma cases like Head injury, Fracture, Burns, Abdominal injury, Chest injury accepted. 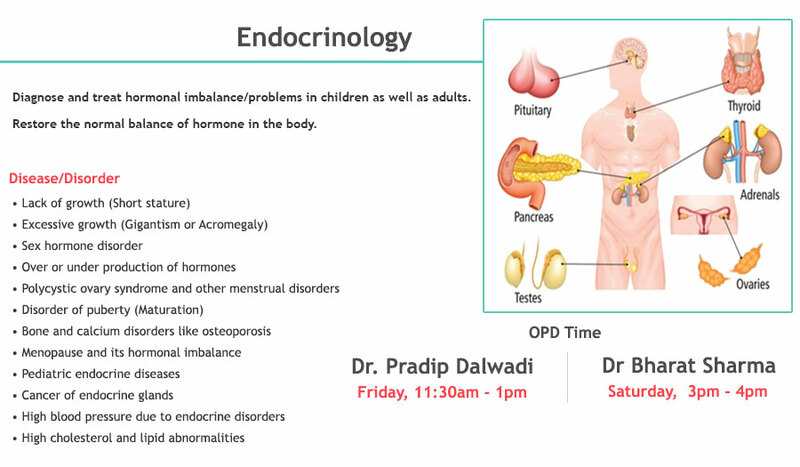 Patients of all age accepted. All medical emergencies like Heart attack, Kidney failure, Coma, Paralysis, Fever, Convulsion, Diabetes, Cancer etc accepted. Adult & Pediatric surgical emergencies accepted. 24 X 7 hours services follows first "Golden hour" principal. 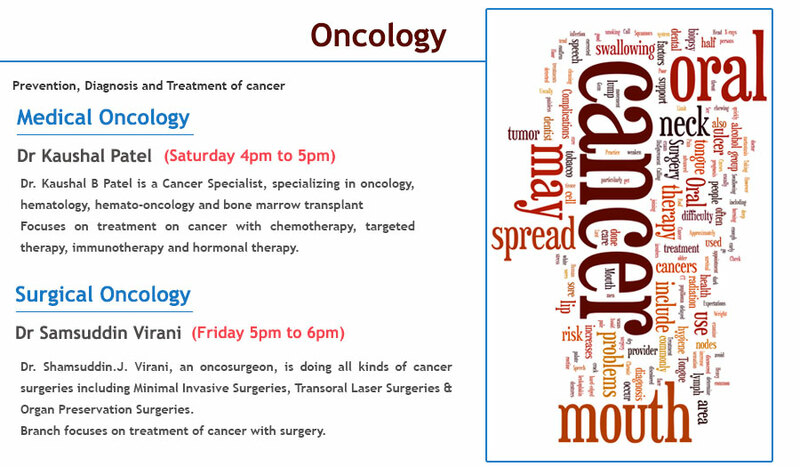 Laboratory:- 24 X 7 services of M.D. pathologist. Blood Gas Analyzer, Auto Cell counter, Blood bank storage center, Histopatho examination. ( for biopsy). Automatic machines. Home visit services available. Cardiac profile, Liver profile, Lipid profile, Diabetes profile, Renal profile, Pre operative & pre employment profiles available. 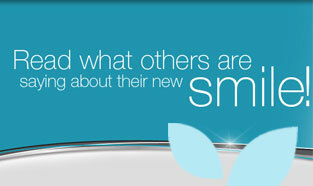 Pre insurance check up & health check up packages available. 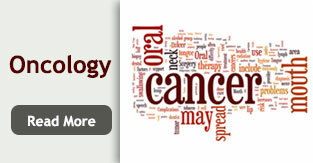 Radiology X-Ray:- 24 X 7 services. Digital X-ray. Portable X-Ray facility available. Medical store:- In house medical store. 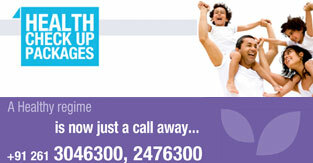 24 X 7 round the clock services. All standard medicines, Surgical items, Implants, Splints & Belts available. Only Standard products available at reasonable rates. Ambulance:- A.C. Trauma care ambulance. Equipped with Oxygen, Suction, Monitors, imported stretcher & immobilization splints. Patient treatment started before reaching hospital. 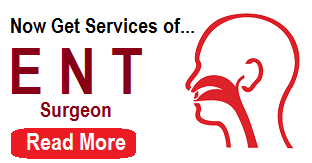 Services of Anesthetist & Ventilator also available. Canteen:- 24 hours open. Special food as per advise of Dietician available. 100 bedded hospital. 19 critical care beds. 11 I.C.U. beds, 8 Surgical ICU beds, & 3 Emergency ward beds. Different type of rooms. Economy class, 3 bed semi private, 2 bed semiprivate, Private with & without A.C., Deluxe room & Executive class rooms. All beds have central Oxygen & Suction line, Central cardiac monitoring, Intercom phone with facility of direct dialing from home. Executive class room has separate rooms for patient & relative, having separate LCD T.V.& A.C. Pantry has Microwave oven, CNG gas line, Freeze, D.V.D. player, Broadband Internet connection. All rooms have specially designed "Handicap toilets". Doors are wide to allow wheel chair inside, Commode seat is high to avoid bending & both side grip bars for support. 24 hours R.O. filtered Cold water for drinking,24 hours Hot water in bathroom, Pantry with gas line, Internet via Wi-Fi routers. Separate room for ICU patient relative & Separate dining room for all relatives.